Make your home your own with three economical style makeovers that transform an average entry. 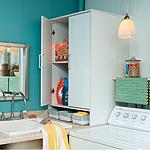 Use these budget-friendly ideas to bring serious function and fantastic looks to your laundry room. Save space in your laundry room and use less energy, too, with this clever wall-mounted drying rack. Learn how today’s high-tech appliances make caring for your clothes easier than ever before. Create this inviting outdoor entertainment area in one day for less than $300. Show off your precious family photos in a unique way with this easy-to-build wall shelf. Turn an eclectic collection of mismatched frames into a cool, coordinated photo display. Kill family room clutter and inject a shot of style with this one-of-a-kind storage system. 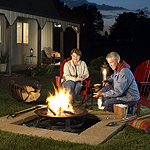 Easy lawn mower tune-up, simple security lighting, wood flooring explained, and much more. Quick cabinet upgrade, drink cooler to go, a great grill idea, easy wall repairs, plus more reader tips. Put a new spin on wall decor with our simple technique for painting circles. It’s easy!